With the evolving nature of application deployment, it is critical that these services be dynamically allocable, fully portable, scale on-demand and procured by a simplified license. You will see a live demonstration of FlexPool™, a software subscription for capacity pooling. 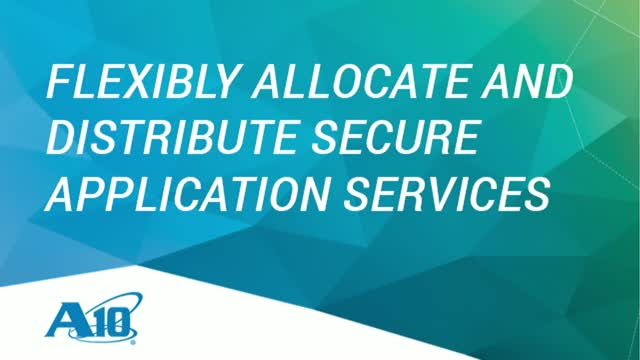 This will allow you the flexibility to allocate and distribute secure application services whenever and wherever you need them. A key initiative in the path to digital transformation is developing new and migrating existing application workloads to include a multi-cloud infrastructure. Applications span from on-premise to public, private, and hybrid environments and include modern application architecture based on containers and Kubernetes. Organizations expect to achieve agility and rapid deployment, better ease of use, elastic scaling, automation, and increased operational efficiency. But in this brave new world, how can you ensure that your applications are secure and that you have visibility regardless of where your apps reside? The adoption of containers is an accelerating trend in the application deployment space and Kubernetes has become the de-facto standard for container orchestration and management. However, many are still learning about Kubernetes and how it can benefit their organization. In this webinar, learn how SSL decryption works from a technology standpoint and the technical challenges related to performance, network topology and routing. El Thunder SSL de A10 es una solución de decodificación desarrollada especialmente para eliminar el punto ciego de SSL/TLS, proporcionando una visibilidad total del tráfico cifrado. Esto aumenta la eficacia de la seguridad en una fracción del costo, descargando las intensas operaciones SSL de la CPU de sus soluciones de seguridad existentes. Únete a nosotros para entender más sobre el Thunder SSL de A10, una solución de seguridad corporativa atractiva y escalable para componer su infraestructura de seguridad actual y prepararla para el creciente escenario de amenazas cibernéticas sin comprometer el rendimiento o la seguridad de la red. O Thunder SSL da A10 é uma solução de decodificação desenvolvida especialmente para eliminar o ponto cego de SSL/TLS, fornecendo visibilidade total do tráfego criptografado. Isso aumenta a eficácia da segurança em uma fração do custo, descarregando as intensas operações SSL da CPU de suas soluções de segurança existentes. Junte-se a nós para entender mais sobre o Thunder SSL da A10, uma solução de segurança corporativa atrativa e escalonável para compor sua infraestrutura de segurança atual e prepará-la para o crescente cenário de ameaças cibernéticas sem comprometer o desempenho ou a segurança da rede. DNS services continue to be one of the top targets for DDoS attacks. When DNS services are disrupted, service providers and their subscribers are taken offline, which can inflict damage and result in loss of revenue and customers. Join this DDoS Defense Insight webinar to learn how to defend against one of the most common and disruptive types of cyberattacks: DNS DDoS attacks. DDOS attacks continue to grow against small and large businesses alike because of profitable extortion, geo-political trends and good ole nihilistic bragging rights. And DDOS attackers keep figuring out new ways to do more with less with newer amplification attacks like those leveraging memcached servers and attacks that target higher level vulnerabilities in the application or application infrastructure. In the past 12 months we’ve seen ground breaking volumetric attacks that exceed 1.2 terabytes. But it takes much less than that to shut the doors of most businesses. You can not depend on your ISP to defend you. The sad reality is that it makes coldly logical business sense for an ISP to shunt your traffic off into a black hole in order to protect itself and the other 99.9% of its customers. In this real training for free event, I’ll bring you up-to-date with the latest techniques being used by state-sponsored attackers, organized crime, hacktivists and the like. Don Shin from A10 Networks, will show us the latest methods and technology for defending against DDOS attacks. And the mileage greatly varies between different DDOS mitigations. For instance, draconian traffic shaping may keep your systems “up” but at the cost of indiscriminately blocking your customers, employees and partners access. For effective surgical defenses you must have the ability to quickly distinguish between legitimate users and attackers. Join us to learn about attack strategies and gain insight into weapons used to inflict massive DDoS attacks. We will also discuss the four critical strategies needed to prevent system failure, while protecting your users. Automating applications also requires automation of provisioning, configuration, and management of application delivery services with the ability to scale out elastically with load. In this webinar, you will learn and experience real-world Enterprise customer use cases on Ansible automation modules from configuring network functions, automating load balancer clusters, and creating L4-L7 configuration. El agotamiento global de los bloques libres de direcciones IPv4 disponibles y la adopción de IPv6, imponen una serie de nuevos retos al crecimiento y la rentabilidad de los proveedores de servicios. En la gran mayoría de los casos, los proveedores de servicios deben diseñar e implantar estrategias de corto y largo plazo, para preservar un recursos extremadamente escaso como lo son sus direcciones IPv4 y migrar su red, servicios y suscriptores hacia IPv6. O esgotamento global dos blocos livres de endereços IPv4 disponíveis e a adoção de IPv6, impõem uma série de novos desafios ao crescimento e a rentabilidade dos provedores de serviços. Na maior parte dos casos, os provedores de serviços devem desenhar e implantar estratégias de curto e longo prazo, para preservar recursos extremadamente escasso como são seus endereçamentos IPv4 e migrar sua rede, serviços e assinantes para IPv6. Durante este webinar você conhecerá mais sobre a empresa A10 Networks, seus principais produtos e seu programa de canais. As communications service providers (CSPs) upgrade their networks to support new 5G and IoT applications, new security considerations will come into play. Beyond just scaling up traditional protection again DDoS and improving SGi/GiLAN firewalls, CSPs need to take a more comprehensive view of mobile security. This joint analyst webinar between SDxCentral and A10 Networks will highlight new security concerns and architectural considerations that CSPs need to understand in light of new business and consumer applications on their 5G networks. Adoption of containers is an accelerating trend in the application deployment space. Kubernetes has become the de-facto standard for container orchestration and management. Please join A10 and DevOps when we discuss the 4 key consideration’s when moving applications to a Kubernetes environment. Join us on this first webinar in the DDoS Defense Insights series, to learn how to defend against one of the most common and disruptive types of cyberattacks: reflected amplification flood attacks. Spoiler alert: port blocking isn’t the right answer. A10’s Thunder SSLi is a purpose-built decryption solution that eliminates the SSL/TLS blind spot, providing full visibility into encrypted traffic. This increases security effectiveness at a fraction of the cost by offloading CPU-intensive SSL operations from your existing security solutions. Join us for an overview of A10’s Thunder SSLi, which provides a compelling and scalable enterprise security solution to arm your existing security infrastructure for today’s cyber threat landscape, and future-proofs your infrastructure without compromising network performance or security. The goal for every security strategy is to spot the threat before an attack is successful. But, without visibility into encrypted traffic, identifying threat activity (whether involving internal or external threat actors) via deep packet inspection is not only difficult, but probably impossible. With cyber criminals increasingly using encryption for cyberattacks, your security strategy can be left with a visibility gap, keeping you in the dark and unaware of current threat activity. So, why is SSL visibility important to your security strategy, and what should you do about it? Adoptar una estrategia híbrida y en múltiples nubes para la entrega de su aplicación también puede llevar a perder la percepción del rendimiento de su aplicación. Compartiremos y demostraremos las últimas funciones de análisis centradas en la aplicación en Harmony Controller 4.1. Nuestro controlador más nuevo ayuda a las organizaciones a obtener información útil sobre el rendimiento de las aplicaciones, la experiencia del usuario final y los problemas de seguridad, y permite una resolución de problemas más rápida y fácil. El controlador Harmony de múltiples nubes brinda inteligencia conectada a través de múltiples servicios de aplicaciones seguras A10: ADC / balanceo de carga, inspección SSL, Gi-Firewall y NAT de grado de operador. Adotar uma estratégia híbrida e em várias nuvens para a entrega de suas aplicações tambiém pode levar a perda da percepção de rendimento de suas aplicações. Compartiremos e demostraremos as últimas funções de análises centralizadas nas aplicações com o Harmony Controller 4.1. Nosso mais novo controlador ajuda as organizações a obter informação útil sobre o rendimento das aplicações, a experiência do usuário final e os problemas de segurança, além de permitir uma resolução de problemas de forma muito mais rápida e fácil. O Harmony Controller de múltiplas nuvens nos entrega inteligência conectada através de uma série de serviços de aplicações seguras da A10: ADC / balanceamento de carga, inspeção SSL, Gi-Firewall e Carrier Grade NAT.